Hospitalized after drowning during a rescue attempt, newly graduated U.S. Marshal Will Castleton is besieged by visions of a hulking executioner torturing a bound man. A perilous race against time leaves Will broken, unsure if he even wants to join the marshals. Escaping to his Michigan hometown, Will finds his father dying, a young woman’s ghost desperate to communicate with him, and a biker kingpin out to make a statement by taking out local law enforcement’s golden boy. 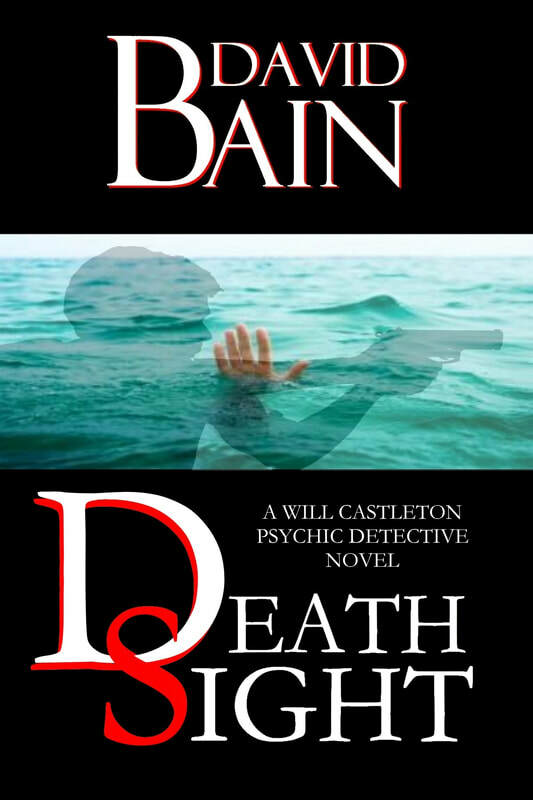 DEATH SIGHT is the first novel in the Will Castleton series, mixing crime and the supernatural. For a glimpse of Will’s future, check out THE CASTLETON FILES, featuring five adventures from diverse points throughout Will’s career. The dead stared at him with dark, empty, accusing sockets that formerly held their eyes. Will’s feet were rooted in a nightlit desert. A full moon. A dry, coppery odor to the air. Cacti. Rocks. Low dunes rising out of the ankle-deep water - for the desert was also the shore of an infinite sea. One of him. Hundreds of them - everyone who would now die because he was still alive, all the ghosts he would ever create, ever encounter. He could not make out the faces of most of the throng of shadowy figures. Those in front he recognized, however. They were the faces of an entire SWAT team, cops from several branches of law enforcement, still in their tattered uniforms. Horribly disfigured, all of them. Only half their flesh still on their raw faces. Their eyes infinite wells of unfathomable dark. He knew the corpse, the spirit that stood at the forefront. Cummings. A decent, if overbearing cop in life. Will could see Marshal Cummings’ tongue through the hole in his flesh, through the gap in his teeth, his jaw. The water wasn’t water at all. Then Will would realize he was already covered in the stuff. The vision would wash over him, even when he was wide awake. Will would come out of it screaming. Thus, the powers that be sent him to see Smith. “Not what you signed up for,” Smith said. “Not what you signed up for,” Smith repeated. He clicked his ballpoint pen, working his thumb, making a sound like a castanet. Maybe it was good this shrink had a nervous habit. Will had thought the whole thing about psychiatrists scribbling in a notebook while you talked was a myth, but not with this guy. Smith laughed. A fiftyish man, silver, slick-backed hair, suspenders, red tie, blue button-down shirt, his sport coat slung casually over his high-backed leather chair. Smith’s clothes were probably worth more than what Will paid for his new apartment here in the city per month, Will in his biker boots - he’d rode his Harley here - jeans, Hold Steady concert t-shirt, a black leather jacket which he’d refused to take off so he could leave faster. “Sorry. Poor word choice.” Smith clicked his pen again, reclined slightly in his chair. Smith sat behind his big faux-mahogany desk. Will hunkered in a seat to the side. Open space between them. There was indeed a couch, but Smith hadn’t suggested he use it. Smith raised his eyebrows at Will as if he expected Will to speak. Mist had collected on the window which took up the entire eastern wall of the room. Lake Michigan loomed beyond, cold and gray and choppy. Wind buffeted the building. Something hissed like a cat and Will flinched involuntarily - an unseen timed aerosol canister had sprayed an artificial pine scent into the room from high atop Smith's numerous, heavily-laden shelves of psychology texts. Will opened his mouth. Closed it. Click, click, click went the pen. The guy wasn't going to be rattled. Will sighed. He clasped his hands in his lap, stared down at them. He looked up and met Smith’s eyes - which he hadn't really done up until this point. They were a washed-out blue. Surprisingly mild. Interested. Non-judgmental. And there was, perhaps, a depth Will hadn’t expected to see there.